Kale, or brassica oleracea, is a green, leafy vegetable that belongs to the same plant family as arugula, cabbage, and broccoli, to name a few. Kale, or brassica oleracea, is a green, leafy vegetablethat belongs to the same plant family as arugula, cabbage, and broccoli, toname a few. It is native to certain parts of Asia and the Mediterranean, andknown to be part of the traditional cuisine of different countries in thepreviously mentioned regions for about 2,000 years. Today, kale is grown indifferent parts of the world and has become particularly popular in the UnitedStates because of its many health benefits. 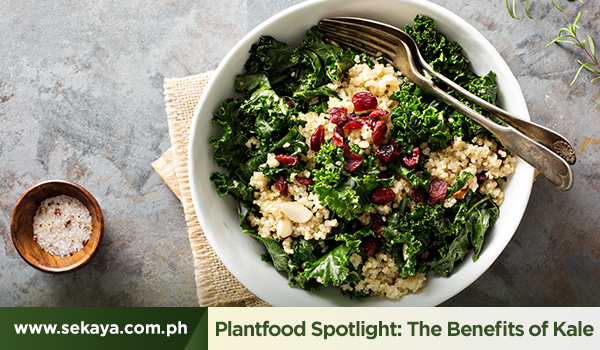 Aside from being a great source of Vitamins A, C, and K, recentstudies have also revealed kale’s potential to aid in the prevention ofdiabetes and heart disease. Its high fiber content is also known as one of thereasons why kale is so popular as an ingredient in salads and several juicecleanse blends. In 20121, researchers revealed that eating raw kale canbe effective in helping the body with digestion and in dealing with oxidativestress due to the polyphenols, Vitamin C, and beta carotene found in the plant.A similar study from 20152 also concluded that the folic acid,ascorbic acid, and riboflavin found in kale gives it the potential to helpprotect the body from cancer and cardiovascular conditions, among others. It issaid that with the ever-growing interest and demand for kale, we can expectresearchers to come out with even more evidence pertaining to the vegetable’shealth benefits. If you’re curious about what kale can do for your health but stillunsure about how to add it to your current diet, you will be glad to know thatthere are thousands of articles on the internet that feature recipeshighlighting kale. Subscribing to a predominantly plant-based diet, keeping up anactive lifestyle, and incorporating any among the infusions of Sekaya BotanicInfusion into your habits, may very well be the beginning of a healthier andlonger life for you. For more information about Sekaya and its line of organic botanicinfusions designed to promote overall wellness, visit: https://www.sekaya.com.ph/products.